Published Articles about the Academy! Please check here to access articles written about the Academy's courses and collaborative learning environment. The San Diego Zoo Global Academy welcomes the Monterey Bay Aquarium! The Monterey Bay Aquarium has joined the Academy's collaborative learning environment! They will have two privately branded customized sites, one for their employees and one for their volunteers. Welcome! Have you joined the Academy Aquarium Group? If you are a subscriber to the Academy, the Academy Aquarium Group is another great way to stay informed about effective ways to leverage online training in your organization. As new announcements are made in the group, the notifications can be sent directly to your email in-box. If you are subscribed to your institution's site, you can quickly and easily be set up to receive these notifications. Just send Gary Priest an email at gpriest@sandiegozoo.org to join the group. Get the inside scoop on these iconic cats! What attracts us to tigers? Those hypnotic eyes? The grace and dignity of the walk? The power and cunning of the hunt? Choose any of a tiger’s charms and you’re hooked. The newest addition to the Animal Species Series, Tigers, explores the physical characteristics, reproduction, distribution, and current conservation efforts to save Panthera tigris. The module includes stunning tiger photos along with interactive learning exercises, videos of tiger behaviors, and a full-audio narration. Quick quiz questions at the conclusion of the module let you assess your knowledge; you’ll be surprised how much you’ll learn. 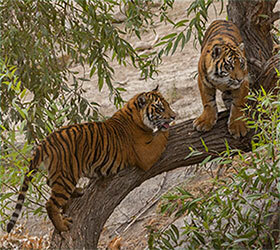 The Tiger module released this month complements the San Diego Zoo Safari Park’s newest experience, the Tull Family Tiger Trail, opening on May 24, 2014. Tiger Trail immerses Park guests in the culture of Sumatra, the home of the critically endangered Sumatran tiger. Tiger Trail includes three separate yards with rocks for climbing, ponds for swimming, deadwood trees to use as scratching posts, and long grasses for catnaps for six tigers. My Academy and The Volunteer Connection are the privately branded custom employee and volunteer sites at San Diego Zoo Global. 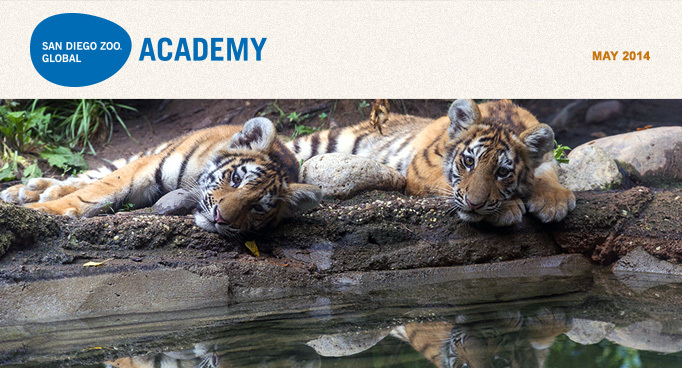 With the launch of the San Diego Zoo Global Academy we also set out to integrate online training into our own organization and this new section of the newsletter will highlight helpful hints from our respective sites. Need a new safety topic for your department meeting? There are hundreds of safety videos loaded in My Academy. Historically, our organization required renting out the very limited safety DVDs—now we have access to a plethora of safety topics to keep the meeting fresh and informative. Please note: San Diego Zoo Global is actively pursuing the integration of online training into our safety training efforts across the organization. Watch for more information to follow as we share steps we take with this important endeavor. Are your volunteers afraid to use the Volunteer Connection site, or perhaps uncomfortable getting familiar with it? Most people learn best by doing, so while introducing the site using a classroom format or tutorials is a great way to start, why not try creating a fun Volunteer Connection Scavenger Hunt? Perhaps you can incentivize it with a fun prize for those who complete it. Your volunteers might surprise themselves with how much they enjoy it, and how easy it is to use when they are motivated to play around and get familiar with it.